Sorry to trouble you but I have a friend due to travel to Cyprus soon and she had every intention of learning to dive whilst there. About 6 weeks ago she contracted Bell's Palsy. There has to date been no real improvement although she is fine in herself. Should she continue with her plans or shelve them until there is either a full or significant improvement in the condition? Or would this be something that would need to be assessed by a diving doctor? The implications I can think of are the fact that her left eye will not close at the moment and she is obviously now a bit "saggy" around her mouth! Will she be okay to learn to dive? Imagine waking up one morning, tottering downstairs for that half asleep bowl of cereal, and the milk won’t stay in – it keeps pouring out of your mouth. Something similar happened to George Clooney when he was a boy, and an astute physician diagnosed him with Bell’s Palsy. It was during his first year in high school too – not a good time to have half of your face paralysed, although it doesn’t seem to have done his career much harm. Named after Charles Bell, the Scot who first described it, it is a peculiar disease of a single nerve (the facial nerve) which controls the muscles of facial expression. Only one side of the face is affected, so sufferers develop a sort of Billy Idol sneer when they smile, and cannot wrinkle one side of their forehead when they frown. It’s most often impossible to find a cause although some cases occur after shingles and it is more common during pregnancy. Interestingly there are some cases that have been caused by diving; air expanding in the middle ear on ascent can exert pressure on the facial nerve (which passes close by), causing a reversible Bell’s Palsy, much like the temporary pins and needles you get when you bang your unaptly named “funny bone”. There is no reliable treatment but most cases resolve on their own in 2 to 3 weeks, and almost all within a few months. As far as your friend’s diving goes, the implications are several: the ones you mention are significant, in that an eye that does not shut properly is susceptible to injury or infection if her mask comes off. Trying to hold a regulator in a saggy mouth is a bit haphazard also, and might expose her to an increased risk of salt water inhalation or free flows. To dive or not? That would depend on the severity of the symptoms but she would be best off being assessed by a dive doc. I suggest it would be better to wait until all the symptoms have cleared up before learning to dive. I qualified OW in October, and to be honest, as I wasn't taking any medication (never have before) I didn't actually think about a dive medical as I have been fit and well, doing a full time active job etc. However, over Christmas, I have had some problems with my right arm (usual place it affects) with the pins and needles, numbness, nerve pain etc., waking me at night and some loss of grip to the right hand. It has settled fairly well now but I am still taking the diclofenac sodium 3 times a day, the tramadol only when the pain wakes me at night as these space me out too much. I would never consider diving if I didn't feel 100% okay on the day but will I be okay to dive whilst taking diclofenac? My husband has just presented me with the flight tickets etc., for a diving trip to Dahab this Thursday! I am aged 59 and have been receiving treatment as a Parkinson's patient for the last 18 years. The disease is fairly well controlled. I have always fancied taking up diving but thought that the Parkinson's Disease would rule it out. Talking with a friend today he mentioned you and suggested I ask the question. So here it is: "Would I be allowed to train and qualify for scuba diving?" This condition has such a broad range of presentations that the answer to your question is not easy. Parkinson’s is one of the “movement disorders”, and results from a loss of cells in the brain, particularly those that secrete a substance called dopamine. The lack of dopamine gives rise to the classic symptoms of impaired motor and speech skills. To dive or not to dive? As usual, it boils down to individualised assessment. Certainly in its early stages, the disease sometimes has very little noticeable effect, and there is no evidence that diving worsens or accelerates it. The potential problems I can envisage are several though. Firstly the physical: Parkinson’s is characterised by muscle rigidity, tremor and slowing of movements, often complicated by poor balance. Practical issues such as donning kit, water entry/exit and finning would become tricky. Secondly, cognitive disturbances: reaction time slows, procedural memory (so-called “how to” knowledge, that used when performing skills) is impaired, and later dementia occurs, with hallucinations, delusions and paranoia developing. Thirdly, medication: the main drug used to treat Parkinson’s is called Levodopa, which attempts to replace the lost dopamine in the brain. It can cause dizziness, confusion and visual disturbances. Several other medicines used to potentiate or control side effects of Levodopa may have their own adverse effects too. All a bit of a worry. So there are lots of possible hurdles, but I would never give an outright “no” without seeing a patient first. 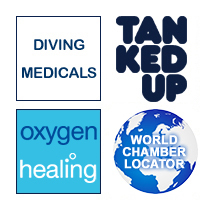 It would be unfair to deprive an individual with mild and manageable symptoms of the pleasures of diving. If you want to take things further, come on in and we’ll see what we can do.